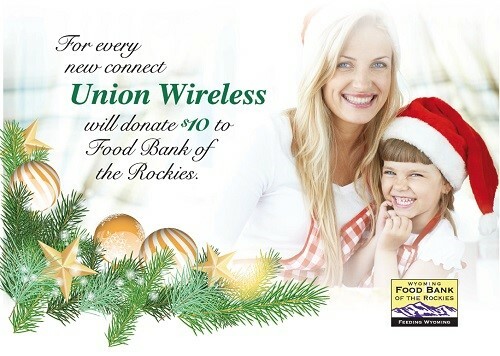 November 23, 2015 - Union Wireless will once again partner with the Wyoming Food Bank of the Rockies in an effort to end hunger statewide. During the 2015 holiday season, the company will donate $10 to the Wyoming Food Bank for each new phone activation. In 2012, Union Wireless donated $14,750 to this great cause via a similar promotion. Located in Mills, Wyoming, the Wyoming Food Bank of the Rockies serves all 23 counties with the help of 245 hunger relief agency partners. Last year, the Wyoming Food Bank distributed over 7 million meals to more than 70,000 Wyoming citizens in an effort to end hunger statewide. The Food Bank of the Rockies was founded in 1978 and operated from a 900-squarefoot schoolroom in northwest Denver. It was then known as the Colorado Clearing House and the fledgling organization collected food from nearby Safeway stores and distributed it to a single agency. Today, the Food Bank of the Rockies has extended its reach across Colorado into Wyoming, providing food to more than 411,000 people annually. Since 1978, the Food Bank of the Rockies has provided nearly 571 million pounds of food to member agencies, translating to more than 476 million meals for people in need. “About one in every eight Wyoming citizens struggles with hunger, people of all ages and from all walks of life, particularly children and the elderly,” stated Shanna Harris, Director of the Wyoming Food Bank of the Rockies. “Corporate backing from companies like Union Wireless plays an important role in fighting hunger. Nearly half of the meals are provided through corporate support. We encourage everyone to donate food, funds, or time by visiting WyomingFoodBank.org. Together we can make a difference,” added Harris.